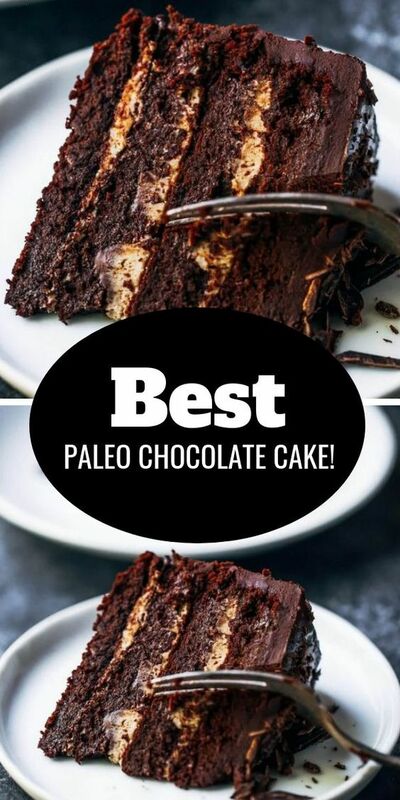 Fudgey paleo chocolate cake made without flour! This low calorie chocolate cake is decadent and frosted with 2 ingredient chocolate frosting. So good! You have to try this paleo gluten free cake for birthdays, celebrations, and dessert time! Preheat oven to 350F. Line the bottom of four spring form cake pans with a cut out circle of parchment paper (6 inch pans). Lightly grease the edges of the pans with coconut oil. In a food processor (or by hand) combine all ingredients for the cake batter (except chocolate chips) until smooth then stir in chocolate chips (optional). Divide batter equally between the four cake pans and bake on 350F for 18 minutes, then remove and cool on a cooking rack until room temperature (you can pop them into the freezer to speed up the cooling process). In a double boiler, melt ingredients for frosting over a low simmer until the chocolate has just melted, then remove it from the double boiler; you don't want to overcook the chocolate- remove it as soon as the chocolate melts! Whip the frosting with a spatula until smooth then chill in fridge for 5-10 minutes (stirring every few minutes) until the frosting reaches frosting consistency. Note: If the frosting becomes too thick, you can melt it slightly with a hair dryer and whip it again. Layer the chocolate cake on a cake stand, filling each layer with either: chocolate frosting or coconut oil caramel frosting- that's what I did this time, see notes for the one I used. Frost the outside of the cake with chocolate frosting. Optional: top with shaved chocolate.